Microsoft's vision for the future, and its purpose as a company, is becoming clear. In an email sent internally, Microsoft CEO Satya Nadella laid out the mission of Microsoft: "To empower every person and every organization on the planet to achieve more." "I'm proud to share that this is our new official mission statement," Nadella wrote in the email obtained by Geekwire. "This mission is ambitious and at the core of what our customers deeply care about." "Today, we live in a mobile-first, cloud-first world, and the transformation we are driving across our businesses is designed to enable Microsoft and our customers to thrive in this world," Nadella said, emphasizing that mobile-first means the "mobility of experiences" that are "orchestrated by the cloud," and not just about mobile devices. Nadella's statement makes it clear Microsoft is ready and willing to embrace a cross-platform approach that brings the best of Windows, Office, and applications to non-Windows users. We're starting to see that shift happening with Office becoming available on iOS and Android as well as talks of Cortana being ported to non-Windows Phone devices. Additionally, we're starting to see Microsoft becoming a services company as it evolves core software products like Windows and Office into services that are constantly updated. As services, these products rely on Microsoft's cloud. "This in turn enables us to attract applications to our cloud platform and attach our differentiated capabilities such as identity management, rich data management, machine learning and advanced analytics," Nadella said. To achieve this strategy, Microsoft has three goals: to reinvent productivity and business processes, build the intelligent cloud platform and create more personal computing. Nadella's vision for Windows is already taking form. With the numerous editions of Windows 10 targeting PC, desktop, tablet, Internet of Things (IoT), Xbox, mobile and more, we're seeing how Windows can power more devices. Nadella said that as a platform, Windows will "enable fundamentally new product categories" and generate more opportunities for the ecosystem. In order to grow, Microsoft will look internally and externally. Externally, Nadella hopes his company will be able to satisfy the needs of customers and users by acting on its mission. Internally, Microsoft wants to drive a culture of leadership that encourages people to take risks. "Over the past year, we've challenged ourselves to think about our core mission, our soul — what would be lost if we disappeared," Nadella wrote. "That work resulted in the mission, strategy and ambitions articulated." Nadella also mentioned diversity and collaboration to find solutions in his email. Diversity means representing everyone on the planet so that "our ideas are better, our products are better and our customers are better served." With diversity the buzz word at trendy tech companies like Google, Apple and Facebook, Nadella's focus on the topic seems like a genuine atonement to an earlier remark suggesting that women shouldn't ask for equal pay and instead trust the system to recognize them for their work. 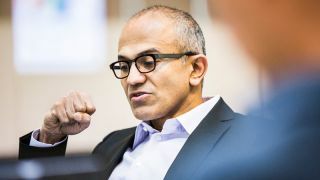 Since then, Nadella has backtracked, stating there is still a lot more that needs to be done. Under the One Microsoft motto, Nadella wants employees to collaborate across boundaries to deliver the best solutions to customers. For Nadella, Windows 10 is at the heart of Microsoft's strategy to empower every person on the planet to do more, as the OS is set to appear in more diverse types of devices. And to connect everything and keep things updated, the cloud will act as a bridge between Microsoft and these devices. All this falls in line with Microsoft's existing ad campaigns – that Windows is for "people who do." Compared to last year's letter to employees where the CEO talked about harmonizing "the world's devices, apps, docs, data and social networks in digital work and life experiences," this year's letter sounds like Nadella has a clearer vision and mission for Microsoft – a broader statement on Microsoft's purpose, position and future in the computing space. Last year's letter appears to be more like a list of goals, or ideas on how to achieve the mission of empowering people to do more.